We are privileged to have the support of some incredible wildlife photographers donating pictures to raise funds for ADI’s Operation Spirit of Freedom. Their beautiful photographs were auctioned as part of a drive on Lion Lovers Facebook Group that raised $26,000 to help save the lions and get them home. 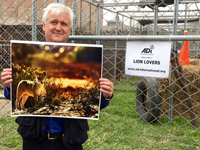 Pictured: ADI Vice President Tim Phillips, in our Peru rescue center before the lion move, with a stunning picture of a Namibian desert lion by Inki Bushbabies.